I remember Arlene with a big smile on her face at Post - You know she still had that same smile at Mumford! ARLENE NISKAR Arlene Sandra Niskar, 74, of Ellenton, Florida, and formerly of Las Vegas, passed away Tuesday, December 19, 2017. She was born December 19, 1943, in Detroit, Michigan, to the late Sidney and the late Jean (Meizler) Charness. 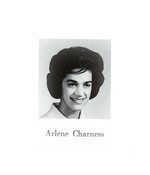 Arlene owned and operated an optical store and then worked as a bookkeeper for 10 years while in Las Vegas. She was an avid reader and Mah Jong player. Considered the very best friend you could have, Arlene had a wonderful sense of humor and was a selfless, giving woman. She was hardworking, independent and took great pride in everything she did. She was preceded in death by her son, Gary Niskar; and granddaughter, Joella Niskar. Arlene is survived by her children, Terri (Wayne) Janda and Michael Niskar; grandchildren, Alex Janda and Nicolas Pheifer; brother, Larry Charness; sister, Barbara (Ronnie) Blackman; and a number of very dear cousins, nieces and nephews. Memorial service were held Friday, December 22, at Temple Sinai, 9001 Hillpointe Road, Las Vegas, NV 89134. Click here to see Arlene's last Profile entry.